Take Current Affairs quiz March 13, 2019 to enhance your General Awareness. Practice with our esteemed Current Affairs quiz March 13, 2019 questions which covers all important events across India as well as World. Make use of all important Current Affairs quiz March 13, 2019 questions with answers updated here, at free of cost to succeed in all competitive Exams and Interviews. In which State did 4 patients received artificial limbs through the Chief Minister’s Comprehensive Health Insurance Scheme (CMCHIS)? Four patients received artificial limbs through the Chief Minister’s Comprehensive Health Insurance Scheme (CMCHIS) at the Department of Physical Medicine and Rehabilitation, Government Stanley Medical College Hospital, Chennai, Tamil Nadu. Spherical collections of thousands to millions of stars moving as one unit is called _________. Globular clusters are spherical collections of thousands to millions of stars, moving as one unit. Which of the following is India's dedicated multi-wavelength space observatory? AstroSat is India's dedicated multi-wavelength space observatory which endeavours for a more detailed understanding of our universe. To support which Country's start-up ecosystem did Facebook launch ‘Facebook Hubs'? Facebook launched ‘Facebook Hubs’ at 20 locations in India to support the start-up ecosystem in the country. Which of the following mobile app did the Election Commission of India develop for the Lok Sabha election 2019? Election Commission of India has developed cVIGIL, a mobile app, for the upcoming Lok Sabha election. ‘cVIGIL’ stands for 'Vigilant Citizen’. SEBI withdrew the ________ limit on investments by Foreign Portfolio Investors (FPIs) in corporate bonds of an entity. Securities and Exchange Board of India (SEBI), the markets regulator, withdrew the 20% limit on investments by Foreign Portfolio Investors (FPIs) in corporate bonds of an entity. Which campaign entered the Guinness World Record for the largest collection of clothes for donation? Vastradan Campaign initiated by the erstwhile royal family of Udaipur has set the Guinness World Record for the largest collection of clothes for donation. Which of the following Organisation has developed a range of combat drugs that can save lives in the event of warfare? The Defence Research and Development Organisation (DRDO) has developed a range of combat drugs that can extend the golden hour till the soldier or an armoured unit is shifted to hospital after an attack. Which Indian athlete was selected as Barbie role model & was presented with a one-of-a-kind doll by Barbie? Indian gymnast Dipa Karmakar was selected as Barbie role model & was presented with a one-of-a-kind doll by Barbie as the company celebrates its 60th anniversary. She was part of the ‘Shero’ program launched in 2015 by the company. Who invented the World Wide Web in 1989? British scientist Sir Tim Berners-Lee invented the World Wide Web in 1989, while working at European Organisation for Nuclear Research (CERN), Switzerland. On April 30, 1993, CERN put WWW software in the public domain. When is the UK due to leave the European Union? UK is scheduled to leave European Union (EU) at 11pm UK time on Friday, 29 March 2019. Which bank Sanctions Loans Worth Rs 689 cr to 1,600 MSMEs Via Online Portal? Punjab National Bank Sanctions Loans Worth Rs 689 cr to 1,600 MSMEs Via Online Portal. Who received Yaswantrao Chavan National Award? Shri Raghuram Rajan received Yaswantrao Chavan National Award. Who has been appointed as the new Chairman of Axis Bank? Axis Bank has appointed Rakesh Makhija as Non-Executive Chairman for a period of 3 years. He will take over from Sanjiv Misra when his term ends on July 17. World Health organistaion (WHO)organistaion released the Global Influenza Strategy 2019-2030. Which of the following cricket team tops ICC T20I rankings with 135 points? Pakistan tops ICC T20I rankings with 135 points and enjoys a 13-point lead over second-placed India (122) with England remaining at third place with 121 points. What is the position of India in global gold reserves, with 607 tonnes of gold reserves at RBI? According to data provided by the World Gold Council (WGC), India has the 11th largest gold reserve and the current holding pegged at 607 tonnes. According to the latest report of World Gold Council, which country has the World’s largest gold reserve? United States has the largest gold reserve worldwide, with 8,133.5 tonnes. It is followed by Germany with 3,369.7 tonnes. International Monetary Fund (IMF) ranks third on the list with total gold reserves of 2,814 tonnes. India’s first LGBTQ Clinic and HIV treatment centre inaugurated by Humsafar Trust in ________. India’s first LGBTQ Clinic and HIV treatment centre inaugurated by Humsafar Trust in Mumbai. Are you looking for right place to enhance your Knowledge on Current Affairs of 13th March 2019 through effective Quiz section? 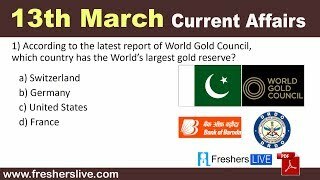 FreshersLive grants you the advantageous Current Affairs Quiz questions with accurate answers for 13th March 2019 which covers all the important events, supreme Awards, major occurrences in the National as well as World level. All important Current Affairs Quiz questions of 13th March 2019 are updated instantly in this page. Everyday at least 25+ Current Affairs Quiz Questions are displayed in this FreshersLive page. Correct Answer for each quiz question is given at the end of the entire 13th March 2019 Current Affairs Quiz questions section. You can estimate and upgrade your GK by attending these useful quiz questions. Entire quiz questions of 13th March 2019 Current Affairs covers Competitive Exam as well as Interview point of essentially important topics like International News, National News (ie. Indian Affairs), Science & Technology News, Environmental News, Bills & Acts Passed by Government, Defence News, About important Persons, Places, Banking & Economical News, Awards & Honours, Sports News, Revolutionary Updates on Arts & Culture, Obituary, Summits & Conference, Important Committee, Schemes, Appointments, Important Days & its Theme for Current as well as upcoming Year, Books & Its Authors, Agreements & MoUs, Budget, Taxes, Various Important Lists & Indexes, Visits by World Presidents, Prime Ministers, Political affairs and all Current Events. 13th March 2019 Current Affairs Quiz Questions updated in this page are prepared in the sense to help all aspirants to succeed in various Competitive Exams like UPSC IAS and other Civil Services Examination, Various Bank exams like IBPS PO, IBPS Clerk, SBI PO, SBI Clerk, RRB PO, RRB Assistant, Insurance exams like LIC AAO, UIIC Assistant, Railway Exams, Various Central Government Exams like SSC CGL, SSC CHSL, and more. Attempt all the Current Affairs Quiz Questions of 13th March 2019 and evaluate your score by matching your response with the correct answers mentioned at the end of this quiz questions section. By practising the FreshersLive Current Affairs Quiz Questions on a daily basis, you can surely succeed in the competitive exams as well as the interviews easily. Make use of this ultimate resource to the fullest and quickly achieve your goal!